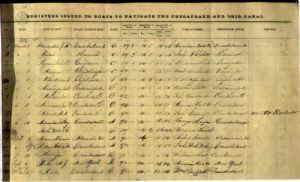 A page from the Registers Issued to Navigate the Chesapeake and Ohio Canal 1873. It includes entries for name of the boat, its hailing place, length, width, draft (loaded and unloaded), and the name and residence of the owner. There is also a remarks column which appears to have been used primarily for information about change of owner or name of boat.